Merchant Services in Point of Sale with MFA and Token expiration. Point of Sale is introducing changes to the security of your merchant services that will require authentication of your payments account periodically. This increase in security is the current industry standard, updates in technology have allowed us to increase the security around your payments account to protect your business. Friendly reminders to confirm your login will appear as you open your company file or do your End of Day. Eventually, you will be required to log into your payments account to continue to process payments in Point of Sale. You may sign in and confirm your account at any time by accessing the Login option in the upper right-hand corner. You will be prompted to enter your payments login and password. If you do not remember your password you may choose the option to reset your password. If you no longer have access to the email you used to open your payments account you will need to complete an Email Change Request. 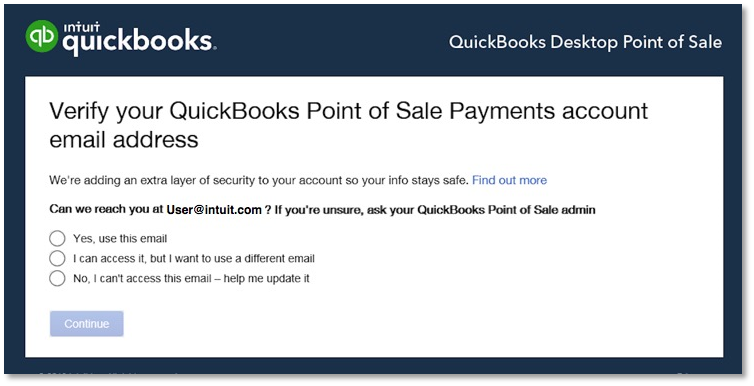 For more information, please see Access your Merchant Services account FAQs to know how to change your email. To complete an Email Change Request, complete this form. Point of Sale will now require you to sign into your payments account for verification on each workstation every six months. 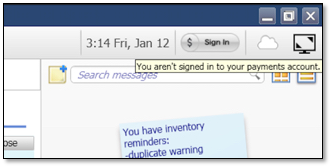 To prevent this messaging from appearing while processing a payment, as well as having each workstation requesting verification on different dates, you may pro-actively schedule when you sign into your payments account. You will be required to do this on each workstation. Once you have completed this sign in the first time, you will be prompted to do so again every six months. You can schedule a reminder to complete this again in six months to prevent messaging from appearing while processing credit and debit cards. Due to security changes around your merchant services account in Point of Sale, there is a new merchant service icon and some new messaging that may appear periodically to prompt you to verify your merchant service credentials. Each message is explained in more detail below. The Email or user ID will already have your information pre-filled, you will only need to enter your password to sign into your merchant services account. 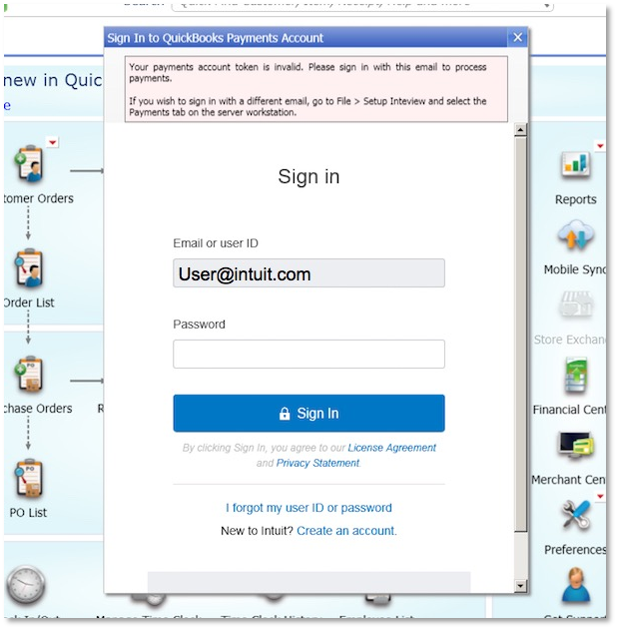 Selecting the option to Sign Out will sign you out of your merchant account and you will not be able to process credit and debit cards on that workstation only. If you go to File > Setup Interview and select the Payments tab and choose the option to Sign Out, this will sign out all workstations from your merchant services account. Doing so will prevent all workstations from being able to process credit and debit transactions. After signing out of your payments account from the Setup Interview on the server, all workstations will be signed out of merchant services and will not be able to process credit or debit card payments. However, there can be a delay after the initial sign out. 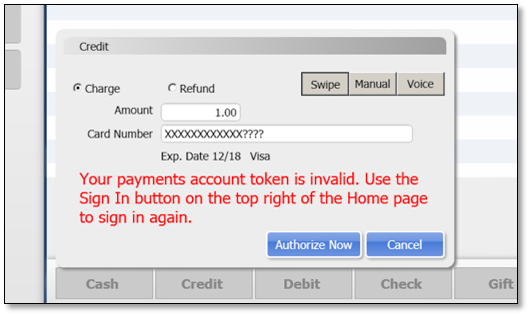 If your workstations attempt to process a credit or debit card payment after you have signed out, the following message will be displayed. 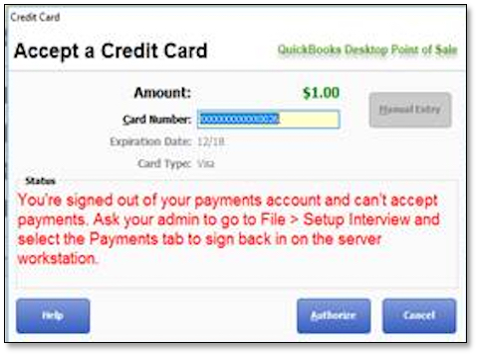 You must sign back into your payments account from the Setup Interview on your Point of Sale server by going to File > Setup Interview and selecting the Payments tab to continue to process credit cards on all workstations. 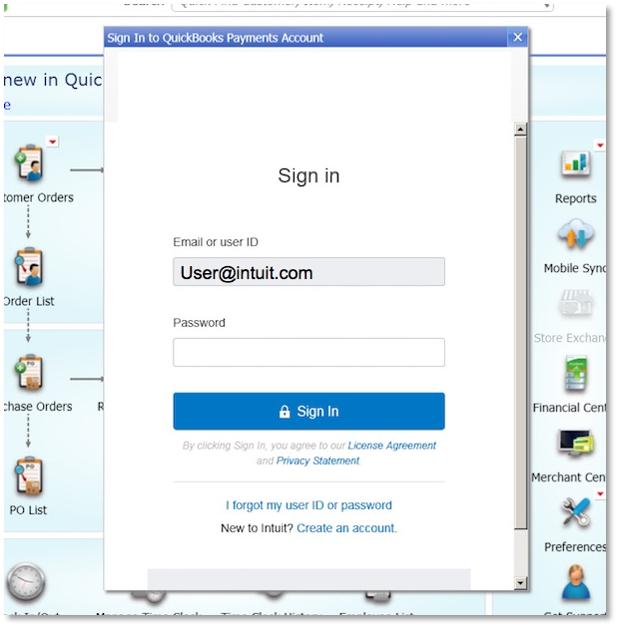 If you do not have access to the email that is linked to your Intuit account, you may find more information on how to change this here. Point of sale will now prompt you to log into your merchant services account to refresh your payments token and verify your account credentials every six months. You may click Refresh on this message to sign into your merchant account, once you have completed this task the message will not appear again until it is time to refresh your payments token again. Remember, you must refresh your token every six months on each workstation. If you need to change the email or user name and password to sign into a new or different merchant account, you will need to do so on the Server by going to File > Setup Interview and selecting the Payments tab. 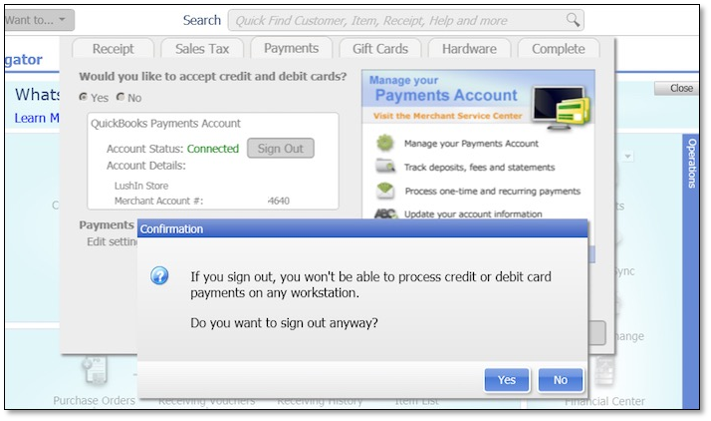 If you select the Payments Icon it will open the Sign In window to sign into your merchant account. To refresh your payments token, go to the Home page in Point of Sale and select the Payments Icon in the upper right-hand corner to sign in. To resolve this issue, update to the latest release by going to Help > Software Updates > Check for software updates. Updates can also be downloaded from our support site.